Valentina Devine is really her name! She first came to my attention in "Knitting in America" by Melanie Falick (1996) in the section featuring Southwest artists. The article was entitled "Valentina Devine's Creative Freedom". Creative freedom really defines her. Later, when in her class, she most often said "It doesn't matter!" And for her that is true; Valentina uses whatever method works to create her textiles: knit, crochet, embroidery, scumbling. For those who need patterns to follow, she begins a liberating inspiration. 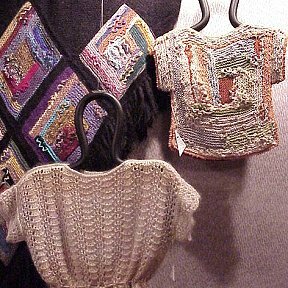 One of the works pictured in Knitting in America is in our entry area. Studying the various techniques is such fun. Color and texture inspire her. 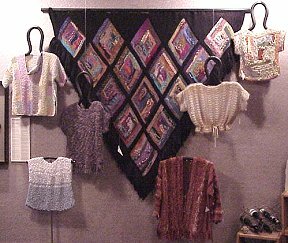 Now in Los Alamos, New Mexico, her life has taken her from the painful memories of persecution in Germany during World War II, her childhood knitting of Germanic precision, to the brilliant colors and earthy colors of New Mexico and a free-flowing designing career. Add to that her talent of dyeing wonderful colors and playing the guitar. The evolution for Valentina was inspired by mentor Irene Preston Miller(early 70's), designer Kaffe Fassett (fall 1980), and friend Horst Schulz. 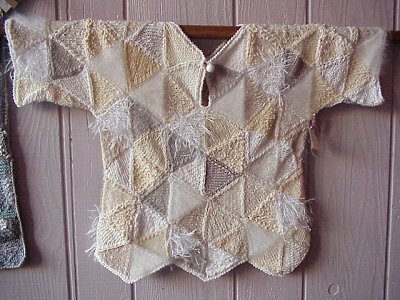 A recent book, Knit Lit by Linda Roghaar and Molly Wolf (2002), has a contribution from Valentina as does "Simple Knits for Sophisticated Living" by Barbara Albright (2003). From the hanging sculptures in galleries and homes to the clothing in boutiques, Valentina's creations catch the eye and inspire textile artists. Her works can be found in boutiques in New Mexico, California and Michigan. E-mail for specifics knitterstreat@wekz.net. And for February, March, and April of 2003 - here! For knitters who want to use her patterns, Knit'Style has shown her designs in every issue since 1998, Knitters Magazine several designs since 1998, and in Ironstone Yarn Company designs. notification list e-mail Ruth Sybers at knitterstreat@wekz.net.